Backwards compatibility in field gear items is allways a big issue, that is why the MLCE/Alice belts (and a few other MLCE/Alice items) have the gromets for the wire hook items used from 1910 to 1956 (And later by the USMC). However, there were a few wire hook items never changed over. There was a very good reason for this. They are the scabbards, sheathes, or holsters with leg tie strings. The abillty for the items to swing freely on a wire hook is a big plus when it's also tied to your leg. This predates the nylon systems by quite a bit, but it was common to find it used well into the 80s. 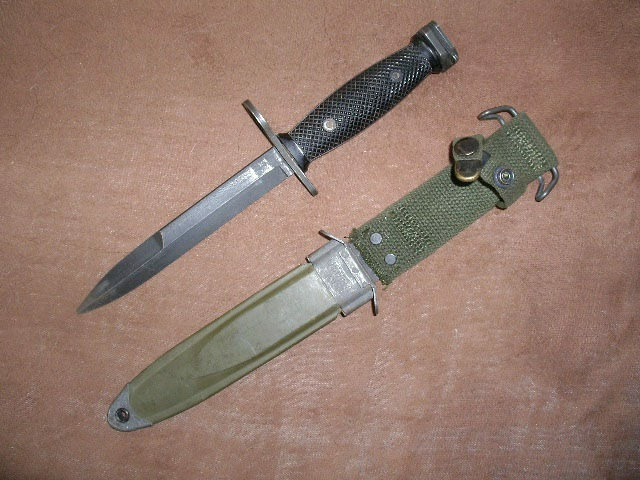 It was made to use with the M3 fighting knife, the M4 bayonet for the M1 carbine, the M5 bayonet for the M1 garand, the M5A1 bayonet for the M1 garand, the M6 bayonet for the M14, and the M7 bayonet for the M16. It seems easier to get the blade out of these but most often the tie string for your leg is often gone. 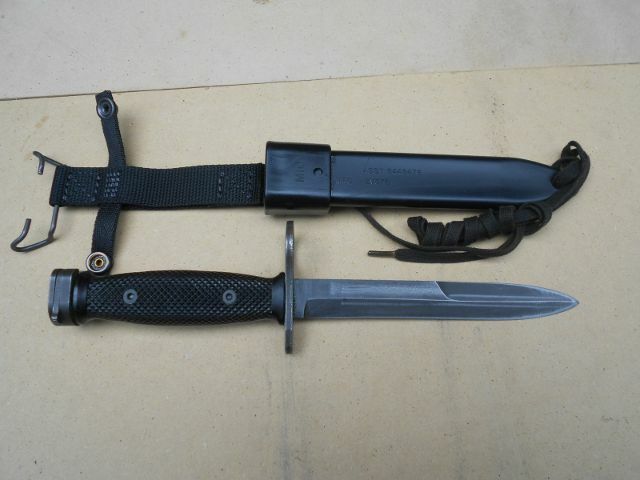 This is the nylon and plastic replacement for the M8A1 scabbard, by this time only the M6 and M7 Bayonets were still in use, but it will fit the rest because the blades are the same shape on all of them. This is easier to find and unlike the M8A1 the tie string is most often intact on these. The drawback is the blade allways seems harder to get out of these. This is the second oldest speced item on the site. This is the scabbard for the M1917 bayonet. Yes bayonet fits the M1917 rifle but that is not why it is listed here. It fits the many US Combat/Trench shotguns with bayonet lugs issued to the USMC and the Army over the years as well. (example, Winchester 1897, Winchester 1912, Winchester 1200, Remington Model 10, Stevens 520-30, Stevens 620, and the Ithaca 37) In the mid to late 60s they ran out of bayonets for them. So instead of designing a new one, someone dug out the old specs and simply had more made. 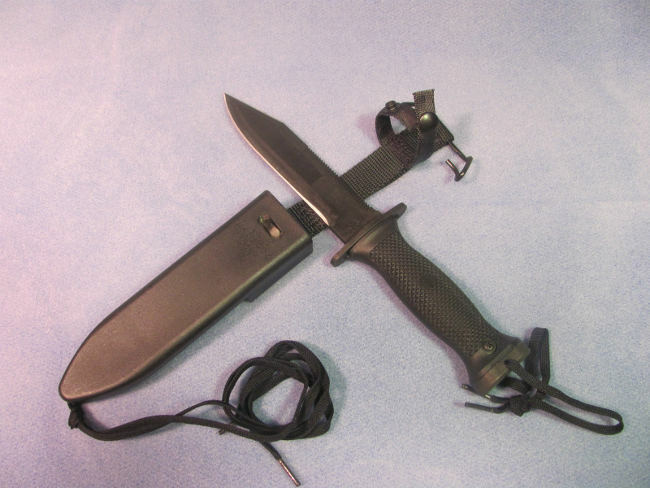 This is a usefull Navy dive knife, it has a wire hook holster included with it. Now this is an obscure but very usefull item. This allows your rifle to be strapped to the side of your rucksack. Now in the Army this was so that ski troops could secure the rifle so that it would not obstruct the use of skis and ski poles. I just find it rather nice to get the rifle secured on my rucksack when I am navigating. It was designed for the lightweight rucksack, but it works just as well on the first generation LC-1 Medium alice rucks. Sadly later alice rucks had the grommets removed. This is for your Machette.